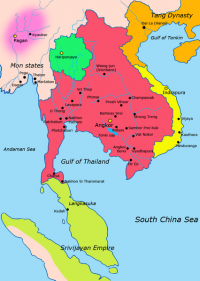 Map of Southeast Asia circa 900 CE, showing the Khmer Empire in red, Champa in yellow and Haripunjaya in light Green plus additional surrounding states. Image: Wikipedia. (PhysOrg.com) -- The Khmer Empire, known to many as the Angkor Civilization, was a society of people that lived for several centuries in Southeast Asia in what is now Cambodia, Thailand, Laos and Viet Nam. What has kept the memory of the empire alive are the huge structures built by the people who lived in the area during that time. Also of note were the roadways, canals and water movement and storage systems that were constructed to support a large population. But like many other lost cultures, what was once a flourishing metropolis, in a very short period of time, gave way to collapse. Now, work by a group of scientists indicates it may have been due to drought. The group, led by Mary Beth Day, an earth scientist with the University of Cambridge, is to have the results of their efforts published in a report in the Proceedings of the National Academy of Sciences. The Khmer Empire existed from the period between the 9th and 15th centuries and was centered around the city of Angkor. During that time, it’s very clear that great effort was put into capturing massive amounts of water that came from the skies during the monsoon seasons in the summer, to support drinking and crop growing during the rest of the year. The system apparently worked great for a long time, then suddenly didn’t. The reasons put forth for this sudden change have varied, from disease or warfare, to public strife, to changing environmental conditions. Now, it appears due to this latest research, that at least one of the major factors was indeed environmental. To find out if the problem was a dearth of water due to changes in the weather or the water system, the team took soil samples from one of the largest reservoirs (called barays) built by the Angkor people. Digging down as far as six feet, the team found that prolonged drought and perhaps overuse of the soil for farming may have led to a society unable to feed itself, a sure and straight path to an untimely demise if ever there was one. In studying the soil samples, the team was able to see sediment deposits that had built up on the bottom of the baray over time. During the years leading up to 1431, thinner layers indicted less water became available for storage. They also showed that the rainfall was more erratic. Instead of steady rains during the monsoon seasons, huge storms would erupt flooding farmlands and dumping massive amounts of soil into the baray, which were then followed by periods of no rain at all. The result was much less water available for drinking and growing crops during the drier seasons, and possible destruction of crops that the people were able to grow, due to flooding. This new research doesn’t prove for a fact that it was drought that led to the demise of the Khmer Empire, of course, as there were other factors involved. War with neighbors, the conversion of many of the inhabitants to Buddhism, and natural dispersion due to increasing trade with other countries, all likely had a hand. But it does appear that changing weather patterns might have been the final straw. "...a society of people that lived for several centuries..."? Either that was a MOST remarkable population, or a most remarkable grammar fail. My guess is they created a welfare state and those who produced and maintained the infrastructure were over taxed to the point they just shrugged. This article is a long winded version of the conclusion, which is "We dont know". SE Asia drought appears to have started about the time of the little ice age (end of medieval climate optimum) in Europe/North America. Too many 100 watt light bulbs killed them off...obviously. Think the one about the Maunder Minimum coinciding with the climatic instability and rings true to me. To the tea party fanatic who better hope HE NEVER needs the social safety net that he seems to want to tear up in order to please rich people who would never speak to him on the street and who would call the police to remove him if he so much as set foot on the corner of their lawn. Not the first time in history a nation-state has destroyed itself after politicians discovered they could bribe voters with the contents of the national treasury. ......Angkor Civilization? ....Angkor people? Where the hell did this 'reporter' learn his history. Khmer Civilization and Khmer people respectively. Khmer is the same as Cambodian. "Up to 2500 US Marines will be stationed in Australia for six months of every year under a new bilateral defence deal sealed today by Julia Gillard and Barack Obama today. The agreement will also allow more US ships and military aircraft - including B52 bombers - to operate from Australian bases." "The US wanted to expand its presence in the region, while Australia wanted to send a message about the strength of the Australia-US alliance." How much is Australia paying the USA for their national defense? The US tea party is trying to return the USA to liberty and prosperity from the present socialist malaise caused by the democrats and the Obama regime. Current growth in Canada and Australia have everything to do with the conservative principles of lower taxes and private property rights. But then Australia is going down the socialist rabbit hole with its carbon tax. "Canadian Prime Minister Stephen Harper announced that he will slash corporate taxes again on Jan. 1 in the final stage of his Economic Action Plan, dropping the federal business tax burden to just 15%." "Along with fresh tax cuts in provinces such as Alberta, total taxes for businesses in Canada will drop to 25%, one of the lowest in the G7, and below the Organization of Economic Cooperation and Development average. "Creating jobs and growth is our top priority," said Minister Jim Flaherty. "Through our government low-tax plan ... we are continuing to send the message that Canada is open for business and the best place to invest."" "The Harper government has pursued a strategic objective to disembed the federal state from the lives of citizens,"
"Harper also has made signing free trade treaties his priority. Canada now has 11 free trade pacts in force, and 14 under active negotiation "
"Lastly, Canada has pursued its competitive advantage oil. And it did so not through top-down "industrial policy," but by getting government out of the way. Harper has enacted market-friendly regulations to accomplish big things like the Keystone Pipeline and urged President Obama to move forward on it or else Canada would sell its oil to China. These policies have been well-known since the Reagan era. But in a country that's been institutionally socialist since the 1950s, Harper's moves represent a dramatic affirmation for free market economics. For Canada, they've had big benefits. Canada's incomes are rising, its unemployment is two percentage points below the U.S. rate, its currency is strengthening and it boasts Triple-A or equivalent sovereign ratings across the board from the five top international ratings agencies, lowering its cost of credit." You should learn when to stop lying. For starters, none of Obama's policies have even taken effect yet, as most of htem came with years delay before they go into effect. It is the republican's tax cuts on the filthy rich, under Bush, which help drive up deficits and the debt. that's what happens when republicans take office: Cut taxes on people who don't really need money, cut fed revenues by a half trillion, but keep spending more and more on the military. If you cut revenue by half trillion, but keep spending as republicans did for 8 years, well, debt tends to jump by 4 trillion or so. Then you have interest on the debt which got bigger and bigger till soon interest will be the biggest single form of spending. THE BUSH TAX CUTS ON THE WEALTHY. What has he been doing for 3 years? he spent two years forcing Obamacare through a DEMOCRAT controlled congress. "Defying Congress, President Obama used his recess appointment powers Wednesday to name a head for the controversial Consumer Financial Protection Bureau and three new members to the National Labor Relations board moves Republican senators said amounted to a constitutional power grab." Obama's policies have not take effect yet? Are you seriously comparing Australia, a country of 22 million people, to the United States, a country of over 300 million? The Scandinavian countries are doing much better than both of us, but do you think it's fair to compare apple to apple two countries with populations that are separated by orders of magnitude? A more fair comparison is between Australia the US state of Texas. Texas is doing quite well economically. Chairman and CEO, Eastman Kodak Company"
"Eastman Kodak Co. is preparing to seek bankruptcy protection in the coming weeks, people familiar with the matter said, a move that would cap a stunning comedown for a company that once ranked among America's corporate titans. "General Electric Co. (GE)s health-care unit, the worlds biggest maker of medical-imaging machines, is moving the headquarters of its 115-year-old X-ray business to Beijing to tap growth in China. " GEs CEO is also on the President's Council on Jobs and Competitiveness. Sudden demise of Khmer Empire. But it does appear that changing weather patterns might have been the final straw. Again this is natural cycles causing climate change (drought like in the 1920-1930s in the USA (with 220 parts /million), that has cause the down fall of nearly every civilization since the earliest settlements of mankind when CO2 was around 220 parts /million. There are other exasperating circumstances that help nudge the decline of empires along. Apart from wars. That's the overburdening of the workers by a bulging class of governments, rulers, bureaucrats & regulators that in the end become to expensive & burdensome to afford. The drought or climate change is the straw that breaks the camels back, causing chaos, rebellions and sometimes war. I see the demise of the EU the USA and Australia eventually due to these same possibility's. There is nothing new under the sun, It is an endless cycle of politics, war $ climate change, any one is enough to end the biggest Dreams! Socialism, a plausible reason for the collapse. Everyone use film = Kodak good. All of which has nothing to do with the article, sorry about that. It has to do with Obama's policies. The article suggests other causes for collapse and socialism has been a cause for collapse in many civilizations. Obama policies are socialist and Obama chose the Kodak CEO to be on his team. KODAK makes CMOS and CCDs, or they used to.